A gray squirrel nibbles a winter snack in Westborough's woods. The snow, cold, or rain can make it hard to venture very far outside to encounter nature these days, but there's always the window and the backyard--and gray squirrels. Eastern gray squirrels (Sciurus carolinensis) are common and easy to spot year-round in Westborough, whether they're in the woods, in your backyard, up a tree downtown, or near your bird feeder. As most of us know, these squirrels can be very clever, persistent, and acrobatic when it comes to raiding bird feeders. If you don't actually see a gray squirrel, you might see its tracks in fresh snow, perhaps leading to or from a tree in your yard. The tracks of a squirrel bounding through snow have the two larger hind footprints on the outside, bracketing a pair of smaller front footprints on the inside. Often the prints of the front feet are together and slightly behind the prints of the back feet, reflecting the way the squirrel takes off and lands. If you get a good look at a gray squirrel, it's easy to see that its bushy tail is about as long as its body. An 11-inch squirrel will likely have an 11-inch tail. A gray squirrel makes good use of its bushy tail in its treetop or bird-feeder acrobatics. The squirrel uses its tail for balance as it climbs and leaps through the branches, and its tail may also give the squirrel a little bit of lift during a leap. If a squirrel jumps and misses its treetop target, the tail may help to slow the squirrel's fall through the air, leading to a softer landing on the ground. That bushy tail also protects its owner from the elements. It can serve as a blanket--a squirrel can curl up to sleep, tuck in its feet and head, and wrap its bushy tail around itself to keep warm. In the rain, a squirrel can fold its tail up over its back to help keep the rain off its body, sort of like an umbrella. Squirrels also use their versatile tails to make gestures in their communication. If you hear a squirrel chattering or barking excitedly and manage to spot it, you may see it flicking its tail. You can see a gray squirrel just about anywhere, but they like hardwood forests with trees that produce lots of nutritious food--especially acorns, hickory nuts, or beech nuts. Westborough has these trees, and our woods and our yards have plenty of acorn-producing oaks. Gray squirrels also live in mixed areas with both hardwoods and pines. As it turns out, gray squirrels aren't the only squirrels in town. Somewhat harder to find at any time of year are the red squirrels (Tamiasciurus hudsonicus). Also known as pine squirrels or spruce squirrels, they are smaller and feistier than the gray squirrels. They tend to live among pines and feast on the seeds in pine cones. You might see a red squirrel in the pines that border the Westborough Reservoir (Sandra Pond), either in the Bowman Conservation Area or in Minuteman Park along Upton Road. The town's Libbey property also has large, old white pines that are home to red squirrels. Westborough's woods also contain southern flying squirrels (Glaucomys volans), but you're not likely to see one because they are active at night. Flying squirrels glide through the air with the help of a fold of loose skin between the front leg and the hind leg on both sides of their body. The folds spread out, wing-like, during a glide. February is the year's first mating season for both gray squirrels and red squirrels. If you see a couple of squirrels following or chasing another one, this pursuit might not be just a game. You may be witnessing a mating chase, with a couple of males trailing after a female. The second mating season will come around in July, so you'll have another chance to watch for squirrels chasing through the trees and over the ground. But in winter, during the harsh weather that keeps most of us indoors, how do squirrels survive? Unlike their smaller relatives, the chipmunks, gray squirrels don't hibernate. Neither do red squirrels. Gray squirrels do get furry and fat as winter approaches, as you've probably noticed in the fall. Their fat helps to keep them warm in the cold and to supply calories in lean winter months. And gray squirrels also store food somewhere else--in the ground. In the fall they bury nuts and acorns, one by one, in separate holes in the ground. They may also stash them in cracks and holes in trees. Red squirrels also store nuts and seeds, but they tend to pile them together in caches. Gray squirrels are very good at retrieving their hidden nuts, using both their sense of smell and their memory to find them. They can even smell buried nuts when there's a layer of snow on the ground. They often find 85 percent of the nuts they've hidden. Squirrels eat more than nuts and seeds. The fact that they eat a great variety of food helps them survive. When snow blankets everything and makes it hard for them to get at their food stores, they'll eat tree buds and inner bark. In more plentiful times, they'll eat berries, mushrooms and other fungi, insects, and even bird's eggs. Squirrels are not strictly vegetarian. Gray squirrels also get through the winter by sheltering themselves in tree-top dens and leaf nests. At night and during the very coldest days, a few squirrels may huddle together inside a den in the hollow of a tree. The first young squirrels of the year are usually born in such a den, in March or April, about 45 days after a mating. By this time, the female squirrel will no longer share the den with other squirrels. At birth the young squirrels are blind and without hair, much in need of shelter. They nurse for about two months but become independent by three months of age. They may stay in a family group somewhat longer. While the trees are bare, you might notice a big, messy pile of leaves and twigs high in the branches of a tree. It's not necessarily a large bird's nest. This pile may be a leaf nest that a gray squirrel built during the summer. Some squirrel nests are little more than heaps of leaves and twigs, but others are tightly constructed and well insulated. The outside of a ball-shaped leaf nest is typically made of twigs with leaves still on them. Inside are many layers of dried leaves, and finally, a cozy innermost layer of finely shredded bark. The summer leaf nest is usually home to the year's second batch of young gray squirrels. They are typically born in late summer. The female squirrel constructs the nest and nurses and otherwise protects and cares for the young. The summer young may stay in family groups through the winter. Some of them are the squirrels that seem determined to run into the path of a car during the fall. Red squirrels also live in tree-top cavities and in nests in pine trees, but in the winter they also burrow into the ground under tree roots or under a stump. Hawks, owls, coyotes, fisher, and foxes are among the predators that capture squirrels. Squirrels often make warning calls to let other squirrels know when a predator is nearby. Native Americans and colonists hunted squirrels for food. 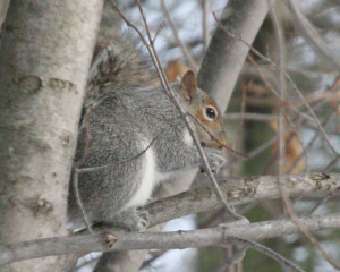 Gray squirrels can still be hunted during specified hunting seasons in many states, including Massachusetts. In some parts of the country, gray squirrels are considered helpful in reforestation efforts. The nuts that they don't retrieve are nicely planted to grow into new trees.